There are many things to admire about John Slattery. From his physical appearance, a full grey hair that makes him look like God in the flesh, his gentle but assertive voice, to his resume, which includes his impeccable work as Roger Sterling on Mad Men and as Howard Stark, the father of the beloved Tony Stark of the Marvel Cinematic Universe. John Slattery has been in the business as a professional actor since 1989 and he has had his work celebrated by several award organizations, including the prestigious Emmy and the Screen Actors Guild Awards. In his over five decades on earth, John Slattery has led a life that many would envy. Read more about him and his accomplishments below. 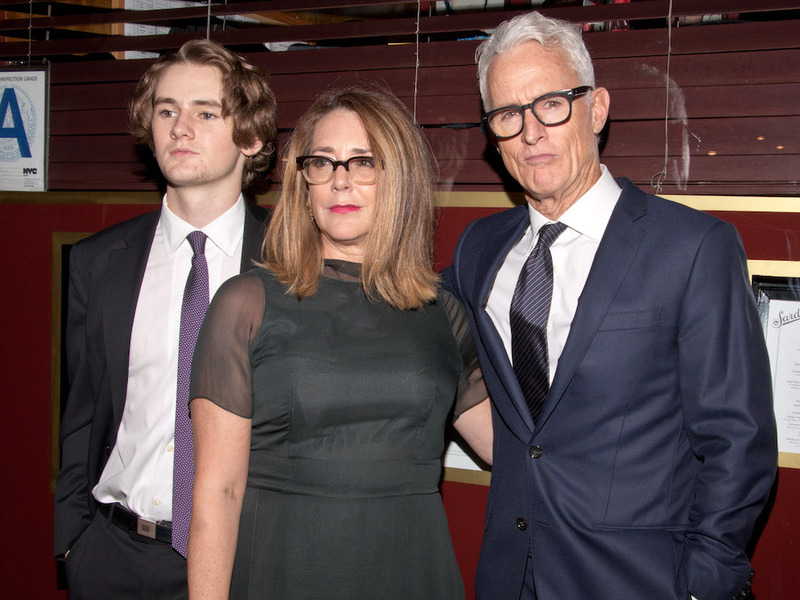 John Slattery is the son of Joan Slattery and John Slattery. His father, John was a leather merchant while his mother Joan is a retired public accountant. He was born to the middle-class family as one of its six children on the 13th of August, 1962 in Boston, Massachusetts. Born to an Irish family and raised in Boston, John grew up as a member of the Roman Catholic church, a fact that made his appearance in Spotlight, a film about the infamous investigation into the conducts of the church a lot more significant. For his education, John attended St Sebastian’s School in Needham and upon graduation, The Catholic University of America where he received a Bachelor of Fine Arts in 1984. John had an affinity for acting, which had developed from his childhood days of watching films and television. So, when the chance presented itself for him to pursue a career in his childhood passion, he took it and relocated to New York, where he began attending auditions in hopes of securing roles in plays and film. Three years after his graduation, he secured his first onscreen role in a television show called Dirty Dozen: The Series. He starred on the show for seven episodes, playing Pvt. Dylan Leeds. It was the onscreen breakthrough he had worked for after years of working as a limousine driver and a waiter. For the first seven, after he got his onscreen debut, John Slattery worked only on television and in the theater. He appeared on shows like Under Cover, China Beach, Homefront, Ned & Stacey and appeared in Off-Broadway plays like The Lisbon Traviata, Mi Vida Loca, The Extra Man, and a few others. He got his first feature-length part in A Woman of Independent Means, a 1995 film. Since then, John Slattery has made appearances in over 30 films, including four films in the Marvel Cinematic Universe – Iron Man 2, Ant-Man, Captain America: Civil War and Avengers: Endgame. Other notable films include Spotlight, which was a critical success and earned an Academy nomination, Underdog, The Adjustment Bureau, and a few others. He got cast for his iconic role as Roger Sterling in Mad Men in 2007 and went on to appear as the character in 85 episodes between 2007 and 2015. Outside of acting, John is also a director, who has directed a film and a combined eight episodes of two shows, including Mad Men which he starred in. His voice has also been lent to audiobooks like Duma Key, A Farewell to Arms and Falling Man. He has also voiced Admiral Havelock in the Dishonored video game. His work has earned him recognition from several award recognitions including SAG Awards for Mad Men, Spotlight, Desperate Housewives and Critics Choice Television Awards nomination for Wet Hot American Summer: First Day of Camp. So far, he has 6 awards out of 19 nominations to his name. Appearing in a commercially successful show like Mad Men for so long and filmography with credits running to over 50 films and television shows have helped John Slattery to a sumptuous net worth of $10 million. Films like Spotlight, Iron-Man 2, and Ant-Man which were a commercial success have played a contributory role in his decent net worth. Despite his amazing position as a well-respected actor with a commendable body of work, John has managed to add a reputation for being a simple decent man. He has been married to his wife, Talia Balsam since 1999 and they both share a son, Harry Slattery. His wife, Talia, is an actress who has appeared in films like No Strings Attached, Killer Instinct, Little Men and currently stars in Divorce as Dallas Holt.